There's nothing better than waking up to hear funny news for a good start to your day. 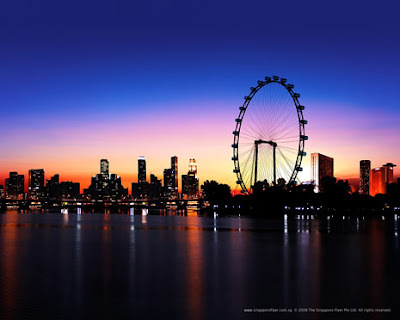 If most of you have noticed, Singapore recently became very much like Genting Highlands or Cameron Highlands, constantly enshrouded in a layer of white. However, it's not the water droplets that we're talking about here, but rather the regular import that we have from Indonesia every few years, haze. Yeap, it's the time again when our dear neighbours decides to burn the entire forest of in Sumatra in the name of building more farms. And it's also the time again when the wind decides to blow all the smoke towards Malaysia and Singapore so we would have a mystical like feel as we go on with our normal lives, thanks to the constant white that seem to envelop everything. And of course, when Indonesia decides to export all the haze over, Singaporeans and Malaysians will start to make noise and complain about how bad this is to our health, economy etc etc. And normally, Indonesia would start apologizing and promises to implement a few serious measures to prevent the forest burning in Sumatra. Or at least make sure that the wind isn't blowing towards Malaysia and Singapore when they decides to burn the forest. But, nothing ever changes. Every few years, the same thing happens. 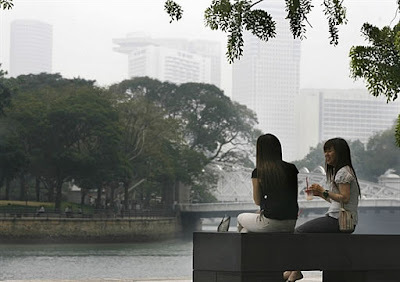 Some fella would burn the forest in Sumatra to clear land, the wind would blow them over to Singapore and Malaysia which is then followed by Singaporeans and Malaysians making lots of noise, Indonesia would then promise to curb the problem, the haze dissipates and everyone goes back to their own lives without actually solving the problem. 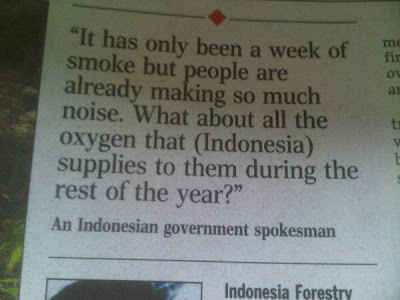 Whoa, i certainly did not know that we're breathing in Indonesian made oxygen into my lungs all year round. 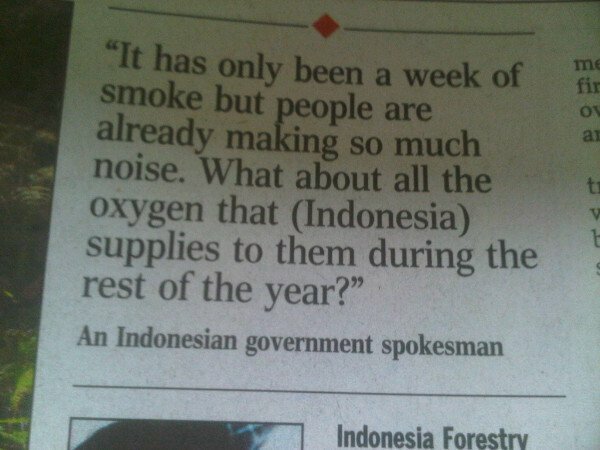 And it certainly sounded to me like a threat coming from the Indonesian government. "If you complain anymore about the haze, we'll make sure that we'll keep burning the forest the whole year round until you cannot see the food in front of you." 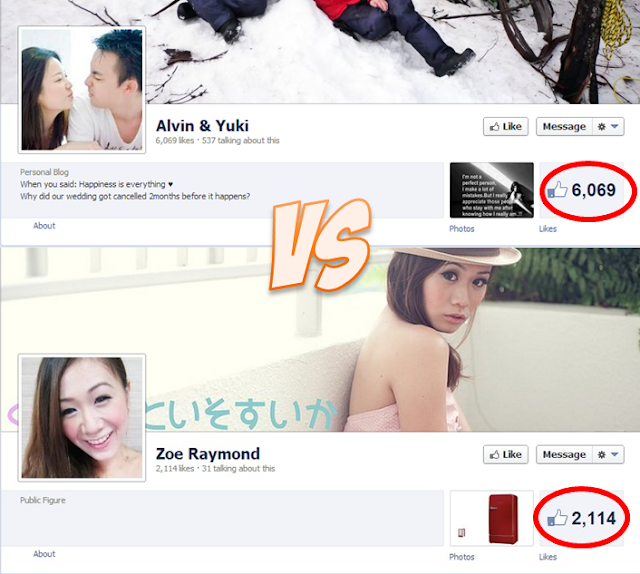 Time to come up with a real big fan and blow all these smoke back to Sumatra to give them a taste of what we're facing. The best solution.